Welcome to my website. 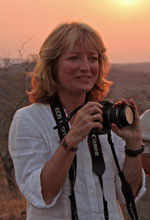 I’m an experienced freelance travel writer based in London with a passion for the wild places and wildlife of Africa. In my former life, I worked for the Crown Prosecution Service and later, after completing a post-graduate MBA, as business manager for a leading criminal law barristers’ chambers. In 2003, I saw sense, packed in the day job and travelled for a year around Nepal and Africa. Inspired by my adventures, I took the precarious plunge into travel writing and have never looked back. I now write about destinations worldwide but readily admit to being a serious Afrophile. Over 17 years of visiting Africa, I’ve been able to explore this captivating continent and have had the privilege of working with some of its best conservation organisations and many inspirational people involved with responsible and sustainable tourism. Click here for my Conservation and Responsible Tourism page. Tourism can play a vital role in conservation and community development and I’m at my happiest when I can combine all of these elements in my writing, shining a light on some of the fabulous work taking place in Africa. Shortlisted for my feature on Zimbabwe: From Victoria Falls to the big five for The Times. 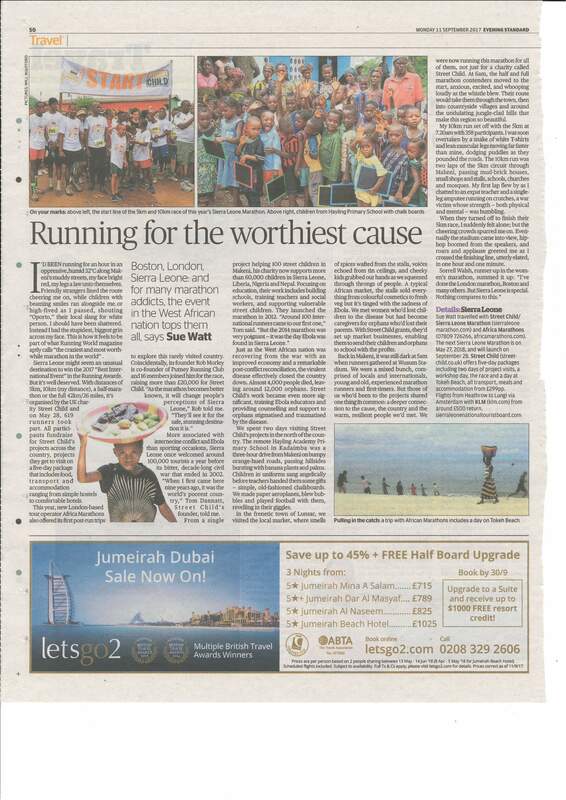 Finalist - Regional Publication Feature of the Year for my story on the Sierra Leone Marathon: Running for the worthiest cause in the London Evening Standard. Winner - Best Wildlife Feature in a National Newspaper for Cecil’s Legacy in Zimbabwe for The Independent. Below is a selection of the newspapers and magazines where my features are published. You can click here to see a selection of my work. I write for travel websites including Rough Guides, Lonely Planet, DK Travel, National Geographic Traveller and Travel Africa and provide a blog column “Sue Watt’s Responsible Travels” and expert reviews on African destinations for Safaribookings. I’m a major contributor to the Bradt Namibia and Bradt Zambia guides, and have co-authored guides on Tanzania, Zanzibar and Pemba. Details can be seen here. I’ve given radio and TV interviews on adventure travel and responsible tourism for BBC Radio Scotland and Arte TV. Click here to see/hear broadcasts. My partner Will Whitford is a keen photographer and his photographs are regularly published alongside my features. All the images on this website and in the Photo Gallery have been taken by him. Please respect our copyright to them - should you wish to use any, just contact me. I pride myself on having excellent working relationships with editors, tour operators and PR representatives, and provide professional, high quality copy and images, always by deadline - but usually before. If you’re interested in feature commissions, reviews, round-ups, news stories or further information, I’d love to hear from you. I’m a member of the British Guild of Travel Writers, the International Travel Writers Alliance and Travel Writers UK. Please note that all photographs on this website are copyright of Sue Watt and Will Whitford - should you wish to use any, please contact Sue.